The Harrow Way Alumni Association (HWAA) is being launched for all our ex-students. It aims to keep everyone in touch, to share experiences, to inspire and motivate our current student body and to highlight how Harrow Way shapes its students’ future lives. We hope to connect or reconnect our former students with news and regular events. Do you keep in touch with your old school friends? What is your fondest memory of the school? Do you have any old photos of your time at Harrow Way? 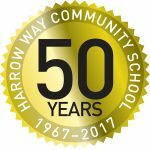 We’ve created a special newsletter commemorating the 50th Anniversary of Harrow Way, it can be viewed here. Harrow Way rounded off their 50th anniversary year in style with a hugely successful fete at the weekend with hundreds of former students, teachers and members of the local community enjoying a wonderful afternoon of reminiscing and a trip or two down memory lane. Joining the many students from the 60s, 70s, 80s, 90s and beyond were four of the school’s headteachers and as many as 40 former members of staff. Commenting on the 50th celebrations headteacher Michael Serridge said: “In September 2016 we looked at what we could do to mark our 50th anniversary, coming up with a number of exciting ideas such as this fete, a coffee morning, a 1960s day for the students alongside a commemorative newsletter and wall graphic. Everyone within the school is enjoying the celebrations and it has been great to meet and hear the many stories about the school and the difference in ‘education’ from past students, teachers and headteachers”. Louise Hoskins, who left Harrow Way in 1998, brought along a whole stash of pictures to share with visitors in the 50th exhibition marquee. Louise, whose mother was one of the very first to join the school in 1967 said: “I had a lovely nostalgic tour of the school and although it’s been modernised it still felt very much the same. It was lovely to see Mr Warren, who was my form tutor and catch up with friends from my year. There were a number of teachers at Harrow Way who were really inspirational and motivational so I look back on my time at Harrow Way very fondly”. As well as bumping into familiar faces there was much to keep visitors busy and entertained with numerous stalls and activities from Squiggles and Wriggles mobile petting zoo, giant inflatables, fire engine and face painting. Lots of fun was had in the photobooth and a line-up of solo artists and the Harrow Way Choir and Allstars Band provided the musical backdrop to the afternoon. 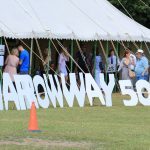 Callie Essop who pulled the entire event together said: “It was a privilege to be part of the Harrow Way 50 celebrations. It was a really successful day and wonderful to see past, present and even future students coming together for this landmark occasion”. Pictures from the event can be seen here.